Looking for a new Saniflo Macerator Pump? Browse our list below. , the products are supplied and fulfilled by Amazon. Click on a product below and you will be taken to amazons website, some products have Amazon Prime. Saniflo have many macerator pumps to deal with all situations, please read our guide. 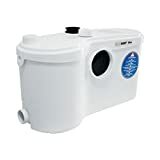 1, Saniflo UP Macerator: This macerator is used just for a toilet, it will connect to most toilet pans and is ideal for a cloakroom toilet or if you have a space under the stairs or a spare cupboard you don’t use. 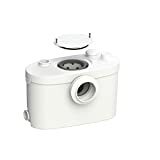 2, Sanitop UP Macerator Pump: This macerator is used for a toilet and a hand basin, ideal for an unused cupboard or if you have space under the stairs to fit a toilet and a hand basin. 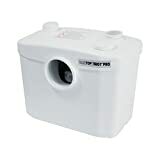 3, Sanipro UP Macerator Pump: This product can take a toilet, shower, handbasin and bidet. Ideal if you want to turn a spare room in to a shower room with a toilet, bidet and handbasin. 4, Saniplus UP Macerator Pump: This product can accept a bath, bidet toilet and hand basin. Ideal if you want to turn a spare room in to a bathroom. 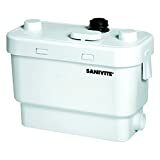 5, Sanivite Waste Water Pump: This pump is ideal if you wan to turn a spare room in to a kitchen or utility room. This pump can accept a dishwasher, washing machine, kitchen sink and waste from a waste disposal machine. This pump needs a 32mm waste outlet pipe or it will not work properly and will void your warranty. 6, Sanibest Pro: This pump is an industrial Saniflo Macerator Pump and can deal with toilet, shower, basin and bidet. This model is noise than the domestic Saniflo pumps but will outlive them. 7, Sanislim Macerator Pump: This macerator pump will allow you to add another bathroom in a property that has a spare room, it will take a shoer, basin, toilet and bidet. This model is slimmer than the other Saniflo macerator pumps and is a space saving device. 8, Sanipack Macerator Pump: The Sanipack Macerator Pump is will allow you to add another bathroom in a spare room of your property, this model will take a shower, toilet, bidet and hand basin. This model is universal and will sit to the left or to the right of a wall hung toilet frame. This macerator pump need an access panel in from of it for service and maintenance. 9, Sanicom Waste Water Pump: This is an industrial waste water pump and allows you to add a kitchen to your home or to a business location, this pump can cake multiple hand basins, dishwashers, washing machines, or kitchen sinks so is ideal for a kitchen or hairdressing salon where there would be multiple sinks needed for washing hair. In a business setting we recommend you install two pumps and use one as a backup pump should one have a technical difficulty and your business will not be disrupted losing time and money to shutdowns. Industrial kitchens and hair salons are normally open on a weekend an would lose valuable business should a pump decide not to work and an engineer or parts are not readily available over the weekend. 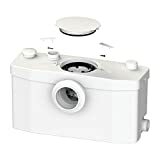 10, Sanicompact Macerator Pump: A Sanicompact allows you to have a toilet and handbasin in the smallest of spaces, this macerator pump will fit under the stairs in in a small cupboard. This macerator pump needs a 240 volt power supply, a mains water pressure via a washing machine valve and a 32mm waste outlet pipe. 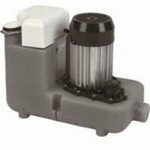 Buy New Saniflo Macerator Pumps See Selection Below! Please select one of the products images below and you will be take to Amazons website, some products may be free delivery if you have Amazon Prime.